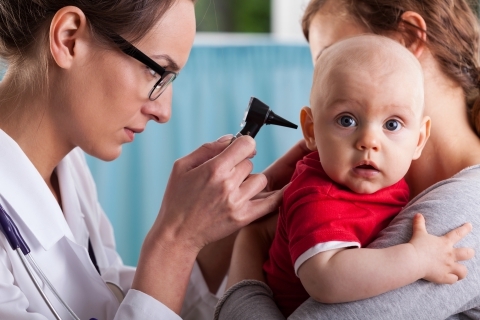 As a pediatrician in Northern Colorado, one condition I diagnose and treat every day is otitis media — the medical name for an ear infection. I am not alone, concern for an ear infection is the leading reason children visit the doctor. By age 3, 80% of children will have had at least one ear infection. While still quite prevalent, the rate of otitis media has declined in the last two decades. The biggest reason for this decline has been the introduction of the Prevnar vaccine which provides immunity to 13 strains of Streptococcus pneumoniae, the most common bacteria in ear infections and pneumonias. Another reason for the decline is a change in physician diagnosis and treatment standards for otitis media. Many mild ear infections are now watched instead of treated and self-resolve. This “watchful waiting” approach has decreased the use of antibiotics, an important public health measure to reduce the risk of selecting for antibiotic-resistant strains of bacteria. A third reason is that rates of cigarette smoking in children’s homes has been in a steady decline over this same period. Exposure to tobacco smoke is a risk factor for the development of ear infections. Even with these reductions in risk we still see ear infections every day at Pediatric Associates of Northern Colorado. What is the process that leads these infections? There are heritable factors that account for about 60% of the risk and that is borne out from our clinical experience. Parents of children with frequent ear infections often report that they got a lot of ear infections in their early childhood, too. This heritable component is related to the particular anatomy of the eustachian tube in children. This is the anatomic structure that connects the middle ear with the nasopharynx. Younger children all have a narrower eustachian tube and in addition, some have more narrow or twisty rather than straight eustachian tubes which they inherit from their ear infection prone parents. What happens next is that the child catches a viral upper respiratory tract infection and this triggers the body’s immune response. The inflammatory chemicals secreted by the immune system cells, called cytokines, cause fever and swelling of the membranes in the nose and throat. They also cause increased mucous production. The swelling causes the already narrow infant or toddler’s eustachian tube to close further and the increased mucous in the middle ear gets trapped. When this fluid becomes seeded by bacteria from the nose and mouth travelling upward through the eustachian tube, they start bacterial colony in the middle ear fluid — Infection!. Once the middle ear effusion gets infected by these bacteria, the symptoms of an ear infection start to become apparent. The growth of bacteria in this closed space creates increased pressure and this causes pain in the affected ear. The body’s inflammatory response goes into overdrive with the new, more serious infection, and fever increases. Left untreated, the immune response may clear the infection on its own. On the way to this, the pressure may increase enough that the eustachian tube opens up allowing the middle ear fluid to drain out. Usually, though, the eardrum bursts from the pressure first. This relieves the pain and drains the infected fluid. Antibiotics have only been available since the late 1940s. Before this time, purposeful rupture of the tympanic membrane by a pediatrician was one of the common treatments for otitis media. We now advocate a “watchful waiting” approach for 24 – 48 hrs after an ear infection is discovered to give some time for natural drainage via the eustachian tube to occur. If pain and fever persist, however, the child is started on an antibiotic to treat the infection. I hope that this detailed description of the pathophysiology of ear infections sheds a little light on how pediatricians think about these common infections and will help parents to recognize when their child might be starting to show signs of otitis media. We’ve come a long way from the 1940s in our understanding and treatment of this common disorder.